Sunday, July 23: I have wanted to return to Yokohama to visit the Yamate Bluff for a long time. After visiting Ofuna and the bamboo garden at Hokokuji Temple in Kamakura, I head to Ishikawacho Station on the JR Negishi Line. Frankly, I’m exhausted from my busy day yesterday, as well as my outings today, but I’m determined to visit at least a small bit of this place. I probably could spend a whole day here, but alas, it’s not to be. For most of the Edo Period (1603-1867), Japan isolated itself from the outside world. When the period of isolation ended after the 1850s, Yokohama was one of the few port towns where foreigners were allowed to reside. Many traders looking to find business and profits in the newly opened country moved into the hills of the Yamate area, known as “The Bluff.” Most of the homes and buildings in this residential district for Westerners were built after the Kanto Earthquake of 1923; today, some of them are designated as historical sites. Yamate is now mainly a hilly residential area with leafy parks, international schools and churches. It is still a residential area for Westerners. It’s 3:23 when I make my way up a very steep hill to Bluff No. 18, a building sitting pretty in the Yamate Italian Garden. It was first built at the end of the Taisho period (1912-1926) as a foreigners’ residence after the Great Kanto Earthquake. After World War II and until 1991, the house served as the parish house of the Yamate Catholic Church; it was moved to its current location and restored in 1993. I have a great view of colorful Yokohama from the Bluff. The lifestyle in a foreigner’s home during the reconstruction period after the Great Kanto Earthquake is recreated inside the house. Reproduced classic Yokohama-style furniture reflects the interiors of that day. The Diplomat’s House served as the residence of Uchida Sadatsuchi (1865-1942), a diplomat of the Meiji government, who held various important positions such as Ambassador to Turkey and Consulate General in New York. The house was originally built in the American Victorian style at Nanpeidai in the Shibuya Ward of Tokyo by the American architect James Gardiner. It was moved to the Italian Garden and designated as a National Important Cultural Property in 1997. I’m not sure what this blue building is, but it sure is pretty. There are many more historical sites in the former foreign settlement of Yamate, but I’m hot and exhausted and it’s getting late in the day. I’m still hoping to see the Foreigner’s Cemetery, but first I have to walk down Motomachi Shopping Street, which runs parallel to the Nakamura River. The street served the needs of the first foreign residents of Yokohama, and introduced many products to Japan. Nowadays it seems similar to other shopping streets in Japan but with a slightly European feel. There are a large number of high-end fashion shops, hair salons, florists, home decor and souvenir shops, as well as cafes and restaurants. By the time I arrive at the Foreigners’ Cemetery, it’s 4:09, and I’m kindly informed by an older gentleman at the gate that the cemetery closed at 4:00. He allows me to take a photo of two tombstones and then I have to be on my way. The cemetery dates back to 1854, when a sailor, Robert Williams, on Commodore Perry’s flagship The Mississippi died after a fall on the ship’s second voyage to Japan. Commodore Perry, the American navy officer who forced Japan to open its ports, asked permission from the Japanese shogunal authorities to bury that sailor on a hill overlooking the water and to provide a resting place for any future Americans who died in Japan. A few months later, a couple of Russian sailors were buried as well. In 1861, part of the grounds of Zotokuin Temple were set aside and have since become the Yokohama Foreign General Cemetery. Today, a small section of the 4,200 graves can be visited, and the inscriptions often offer an interesting glimpse into the life of the interred (japan-guide.com: Yamate and Motomachi and Japan Visitor: Yamate the Bluff District Yokohama). The worst thing about my unfortunate arrival time at the cemetery is that I had to climb a very steep hill to get here, so I’m sweaty, hot and irritable. I decide it’s time to call it a day. It’s a shame I won’t have time to see all of Yamate Bluff, but at least I have a general idea of what it’s like. I make my way back to Motomachi Shopping Street and the train station through the largest park in Yamate, the Harbor View Park, which is named after the view that the park affords onto the water and the Yokohama Bay Bridge. Thursday, May 4: On the second day of my Golden Week holiday, I have a bit of a leisurely morning and then head to Sankei-en Garden, south of Yokohama. I plan to follow Walking Tour 22 from Tokyo: 29 Walks in the World’s Most Exciting City. After taking the train to Yokohama, I have to take a bus. This is the first bus I’ve taken in Japan, so I’m a bit worried I won’t be able to figure it out. However, as I’ve already found during my numerous day trips, Tokyo’s public transportation system is fabulous and easily negotiable. I do believe it might be the best public transport system in the world. I can only speak to my travels in 25 countries, but so far, it’s the tops. When I get off the bus, two Japanese ladies, a mother and daughter, who overheard me ask the bus driver about Sankei-en, point me in the right direction. They have both visited the U.S. and can speak decent English. They tell me this is their first time at Sankei-en too, and I should follow them. We walk about 10 minutes down a long straight road. They tell me about their travels to the U.S. and ask where I’m from and what I’m doing in Japan. At this point, it’s lunchtime and I’m hungry. As we walk along, I stop to look at menus posted in front of several restaurants we pass, but I don’t find anything appealing. As we get just outside the gates of Sankei-en, the women point out a cute souvenir shop/restaurant and tell me I might want to try it. What a cute little restaurant! I order tempura on soba noodles, which hits the spot. A small porch at the back overlooks a pretty garden; sadly the two tables in the porch are occupied, but I do snap a photo over someone’s table. At the table next to me are three young Americans; it always surprises me that when Westerners run into each other while traveling abroad, they rarely speak to each other. It’s as if all of us want to experience the new culture and not be reminded where we come from. I know I often feel that way. I don’t want to waste time getting embroiled in a long conversation about where we’re from and what we’re doing in Japan, so I don’t say anything to them, nor them to me. I prefer it that way. I enjoy just sitting silently, enjoying my meal, and watching the people around me. After my enjoyable lunch, I buy my admittance ticket and enter the garden. The Sankei-en (Three Glens Garden) was created by local entrepreneur Hara Tomitaro (1868-1939), an artistic Yokohama businessman who grew wealthy in the silk trade; he was also a poet, a calligrapher, and a classical Japanese scholar. He was known by the pseudonym Sankei Hara. The primary residence for the Hara family (Sankei) was built around the 30th year of the Meiji era, or 1898. The compound includes a parlor room, living quarters, study, guest room, a Buddhist prayer room, and other facilities. The house is an example of modern Japanese architecture from the Yokohama area. In its time, the compound hosted many artists of the Meiji era art world, including Taikan Yokoyama. Thus the building is highly regarded as a major contributor to the art of Japanese painting. To the natural beauty in the garden, Hara Tomitaro also added 16 historic buildings brought from central Japan. He built his Haku-un-Tei (White Cloud Residence), a traditional shoin-style retreat, in 1920. A shoin is a drawing-room or study, a tatami-room dedicated to receiving guests. Immediately, beside the Main Pond, I come across this adorable Japanese couple having photographs made. I figure they’re in a public garden, so I should be able to enjoy their poses and take some photos as well. Aha, but the young man sees me and catches me in the act. His face looks glum here, but he and his entourage laugh about it shortly after I snap this photo. From across the pond, I can see Nakano-shima Island and its little bridge. The couple seems to be following me! Of course, I don’t hesitate to snap a few more shots. Soon I come to Rinshun-kaku Villa, brought here in 1917 from the Kil Peninsula beyond Osaka. It was built in 1649 by Tokugawa Yorinobu, one of the ruling Tokugawa clan (1603-1868), as his second home. I love the tatami-matted rooms with the sliding doors and the painted walls. The Gekka-den Guest House was built in 1603 by Ieyasu Tokugawa in the compound of the Fushimi Castle in Kyoto. It was used as a guest house where feudal lords stayed when they came to pay their respects to the Shogun. Kinmo-kutsu Tea Arbor was built in 1918 by Sankei Hara and has a one-and-three-quarter-mat tea ceremony room. Choshu-kaku Teahouse was built in 1623 by the Third Shogun, Ietmitsu Tokugawa, in the compound of the Nijojo Castle in Kyoto, perhaps as one of the garden buildings. There are only a few buildings with a structure like this still in existence. This two-storied building of a light style, in its front view, was designed on the basis of a balance that avoids symmetry as much as possible. It was moved to the garden in 1922. Shunso-ro Tea Arbor has a three-and-three-quarter-mat tea ceremony room, which may have been built by a devotee of the tea ceremony. It was moved to the garden in 1918. The Renge-in Teahouse includes a tea room with an uncovered wooden floor between two mats, a six mat hall, and an unfloored space. It was built in 1917 by Sankei Hara. Sanju-no-to is a three-story pagoda of the former Tomyo-ji Temple that is a companion to the main hall which I’ll visit down below. It is 82 feet (25 meters) tall; it was built within the temple grounds in 1457 and is the oldest pagoda in the Kanto region. The Nobel prize-winning India poet Tagor, famous Japanese literary Ryunosuke Akutagawa, and many others have visited this arbor. In the autumn of 1915, Akutagawa composed a haiku poem on his impressions when he enjoyed tea in the arbor. I wish I had a copy of that haiku! Rindo-an Teahouse consists of a six-mat hall and a four-mat hall. Inside the word “Rindo” was written on a board by Sohen Yamada, the founder of the Sohen school of tea ceremony. It is the origin of the name of this arbor. The Tomyoji Temple, like the three-storied pagoda, was formerly in Kamo Village in Kyoto. After being damaged by a typhoon in 1947, the main hall was disassembled and put in storage. In 1986, it was transferred to the garden and restored. What draws me to Tomyo-ji is the quilt exhibit by Fumiko Endo. I love the tiny kimono is pretty fabrics on the black background. Other quilts have cranes, people in kimono, a single kimono and cascading blossoms. I continue my walk through the outer garden and enjoy the ponds, streams and bridges. Nakano-shima Island has a Kankatei Arbor and panoramic views. Yokobue-an is a country-style tea arbor and it is so named because in this arbor, there was a statue of Yokobue, a tragic heroine of a famous love story. The trunk of an Ume (Japanese apricot tree) looks like a crawling dragon. This tree was the model for “Yoroboshi,” one of the famous masterpieces by artist Kanzan Shimomura, in which the famous “Yoroboshi” sits by a big Ume tree. The Old Tokeiji Sanctum of the Zen Sect Style was moved to the garden in 1907 from the compound of the Tokeiji Temple in Kamakura. Little is known about the origin of the old Yanohara Farmhouse with its roof laid with stones. The paper screens are patched with deeds, calendars, and children’s calligraphy exercises. A straw raincoat, sedge hat and hoe stand by the entrance. Seasonal vegetables and bamboo were planted around the cottage, which also features a bamboo chicken coop and a well. Simple rustic scenes like this were the things Sankei loved best. He used this cottage as a place to entertain guests and visitors, according to an interpretive sign. The farmhouse is in the gassho style, noted for its steeply pitched, thatched-roof that resembles hands clasped in prayer. The three-story design was built without nails and its beams are secured by thick straw ropes, according to Tokyo: 29 Walks in the World’s Most Exciting City. From the south gate of Sankei-an, I cross over a waterway to the Honmoku Civic Park. Here, I find the Shanghai-Yokohama Friendship Garden, a classical Chinese-style garden with a Chinese Pleasure Barge, a building in traditional Chinese style on an island in the lake. I don’t plan to continue the walk, which would take me to Hasse-den Kyodo Shiryokan, the Hall of the Eight Sages, just outside the Honmoku Civic Park. From there, I’d have to find a different bus to take me back, or take a taxi. I haven’t yet had to take a taxi in Japan and I fear they’re expensive. So, I opt to backtrack though Sankei-en to the bus stop where I disembarked earlier. Below is my route to Sankei-en this morning. Steps today: 16,711 (7.08 miles). Saturday, April 15: Heading inland from Yamashita Park, I come to Port Opening Square, which commemorates the the 1854 treaty between the U.S. and Japan at what was at that time a small village on Yokohama Bay. The square has fountains, flowers and trees and a memorial to U.S.-Japanese Friendship. Yokohama Kaigan Kyokai, on the border of Port Opening Square, was founded on March 10, 1872, as the first Protestant church for the Japanese in this country. Continuing inland on Minato-odori, I pass the Yokohama Archives of History, established on June 2, 1981, at the historic site where Japan and the U.S. signed the Treaty of Kanagawa in 1854; it exhibits historical materials from the Edo period to the Taisho-Showa era. All along Kaigan-dori, I find miniature garden dioramas under the auspices of the “Spring Flower Festa.” I can’t read any of the Japanese, so I can’t tell what each one represents. Kanagawa Prefectural Office (The King) is one of the Three Towers, a group of historical towers at the Port of Yokohama. They have been given the nicknames The King, The Queen and The Jack. As I approach Yokohama Park, I hear crowds roaring and yelling before I can even see the Stadium, which opened in 1978, holds 30,000 people, and is used primarily for baseball. It’s noisy and I don’t really feel like walking through the park with that stadium in it. By this time my legs are killing me, so when I find a Starbucks on the corner across from the park, I sit at the window bar and enjoy a slice of orange cake and a peach smoothie drink. After a bit of a rest, I am greeted by some pretty tulips dancing in the wind on the border of the park. After leaving Yokohama Park, I walk parallel to the harbor (quite far inland) for several blocks, and then turn toward the harbor again on Basha-michi. This is a very long stretch, with the road eventually turning into Bankokubashi-dori, and I wonder if I’ll ever get back to the harbor. Finally, after what seems an eternity, I reach Shinko Pier, and my book of trusty walks informs me I’ve “left the first part of the tour, which covers the old center of Yokohama, the Kannai (Inside the Checkpoint) sector, in which foreigners were at first restricted to this transplanted foreign community within Japan” (Tokyo: 29 Walks in the World’s Most Exciting City). At the western end of Shinko Pier is the huge steel Ferris wheel I spotted from as far away as the south end of Yamashita Park. It’s part of the Yokohama Cosmo World Amusement Park; the wheel takes 15 minutes to complete a full circle. Past Cosmo World, I cross a bridge and can immediately see the 32-floor sail-shaped Yokohama Grand Intercontinental Hotel. Between the Ferris wheel and the hotel, Yokohama’s skyline is whimsical and welcoming. I make my way through the National Convention Hall complex, a sprawling building of no particular interest, to Seaside Park (Rinko Park), which looks out over Yokohama Harbor from the north side. At this point, I’ve seen Yokohama Harbor from south to north. Beside the Convention Hall is the Yokohama Grand Intercontinental. Rinko Park is a little scruffy and has just a smattering of folks sitting on the concrete steps lining the harbor side walkway or picnicking on the grass. From here, I get a good view of the 1989 Yokohama Bay Bridge, a suspension bridge that extends 860 metres (2,821 feet) from shore to shore. I leave the rather unimpressive Rinko Park and head inland, passing the Convention Hall to my left and walking several blocks past modern but characterless apartment buildings. I reach the inviting wide pedestrian walkway, with fountains and sculptures, bordered by the Yokohama Museum of Art and Landmark Tower on one side, and a huge modern shopping complex on the other. I don’t have time to visit the Yokohama Museum of Art today, but at least I know where it is for a rainy day. This 1989 museum is the second largest art museum in Japan. Its permanent collection includes paintings by Cezanne, Magritte, Dali, and Japanese artists, as well as paintings related to Yokohama. It was designed by Kenzō Tange, a Japanese architect, and winner of the 1987 Pritzker Prize for architecture. The 70-story Landmark Tower is supposedly Yokohama’s best known sight. Designed by American architect Hugh Stebbins, it has a 5-story-high central atrium, with offices and the Royal Park Hotel above. Over 200 shops and restaurants are also inside. I continue my walk through this huge complex, with a glimpse of the Ferris wheel from a different angle. I pass the Nippon Maru training ship docked in an 1896 ships’ basin of stone. Built in 1930, the Nippon Maru was a sailing vessel used to train naval students. It circled the globe 46 times before it was decommissioned in 1984. After passing the Hard Rock Cafe, I realize I need to walk through Landmark Tower to get to Sakuragicho Station. At the basement level, I walk past shops and restaurants and bakeries until I finally emerge on the other side, on a pedestrian walkway over the Metropolitan Expressway K1 Yokohama Route. My plan is to cross through Sakuragicho Station (two stops northwest of where I got off this morning) to continue the rest of the walk to Kangai (Beyond the Checkpoint), which is the original area for Japanese citizens when Yokohama was founded. I’m getting awfully tired by this time, and have walked 20,000+ steps, or over 9 miles. This part of town looks confusing, as it’s not laid out on a grid pattern like the more modern part of Yokohama. To be honest, I have no idea which direction I should go to find the Nogeyama Fudoson Temple, the first place on my walk, and I’m too tired to figure it out. I decide instead to cut this part of the walk short. After all, I can easily continue another day, as I live less than an hour from Yokohama. I return to Amina Collection at Chinatown (how I have the energy for this, I have no idea, but when shopping calls, I must listen! ), where I buy a blue kimono jacket with orange flowers, a lavender blouse with aqua embroidery on the sleeves, and a royal blue cotton top with bell sleeves. The two tops are “one size fits all” and are rather billowy. The shopkeeper, the same thin hippie-ish Japanese girl with the turban and the maize-colored skirt, is still there, and she helps me with the purchase. She can speak and understand English, so she talks nonstop. However, her pronunciation is so abysmal that I can only decipher a few words here and there. She’s very nice and encourages me to go to the tax-free office to get reimbursed for the tax I paid, but it’s in the opposite direction to metro, and I am just too exhausted to bother. I take the train back to Sakuragicho Station, where I have to change to the JR Yokohama green line. I’m not positive I’m on the right train when I get on, so I ask a man sitting directly across from me: “Machida?” There are two lines at that station, one to Tokyo and one in the direction of Machida; this one is nearly empty and we sit at the station for quite a while as the train originates here. The man across from me, who introduces himself as Kaz, can speak English very well, and he asks me where I’m from and what I am doing in Japan. Since he is speaking across the train to me, he asks if he can come sit next to me. He is all dressed in proper business attire; white shirt, tie, black suit; he informs me he has spent the day at the National Convention Hall at a medical products convention. I tell him I had walked past the convention hall earlier in my walk and I show him the map of today’s walk; I admit I’m exhausted as I walked about 10 miles. He says he sells medical imaging technology and tells me about technologies at the conference such as cryo-ablation (freezing of tumors) and RFA (Radio Frequency Ablation, or burning of tumors). He says both treatments result in the tumor dissolving, due to the normal body temperature and the treatment. We talk the entire time back to Fuchinobe, about all kinds of things. He sheepishly tells me at one point, with exasperation but humor, that talking to me all this time has exhausted him; he’s not used to thinking and speaking so much in English, although he seems quite natural at it. He has clients all over the world in many Western and Asian countries, so he is actually used to speaking in English. We both admit when we part ways that the 1-hour train ride back from Yokohama seemed much shorter because of our conversation; I know has been enjoyable for both of us. Total steps today: 23,784 (10.08 miles). Saturday, April 15: This morning, I head for Yokohama at around 10 a.m., taking the JR Yokohama Green Line to Sakuragicho Station, then changing to the Negishi Line for Ishikawacho Station. When I ride my bike to park at Fuchinobe Station, I find an attendant there charging 100 yen to park: I guess it’s only free on Sundays. Oh well, 100 yen is hardly going to bankrupt me. It is easy to find the beginning of Walking Tour 20 (Tokyo: 29 Walks in the World’s Most Exciting City) at Chinatown’s Nishimon-dori (West Gate Street), as it’s right outside the station and there are signs pointing the direction. The 11:15 start to my walk is later than I intended. Little do I know I’ll end up walking over 10 miles today, from the south of Yokohama to the north, all along Yokohama Bay and in and out on a circuitous route through the city streets. 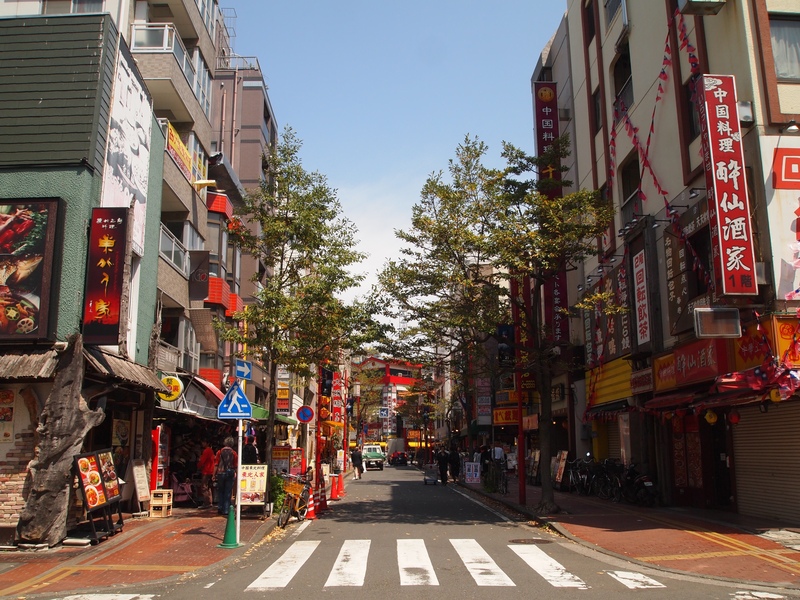 Yokohama’s Chinatown, or Chūkagai, is the largest of three Chinatowns in Japan, followed by Nagasaki and Kobe. It was set aside by the Japanese government in 1863 and now has about 3-4,000 residents, mostly descendants of Chinese from Guangzhou who came as servants of Western merchants or as traders. Some acted as treasurers to Western firms, while others came as craftsmen who could make clothing and other essentials needed by foreigners. 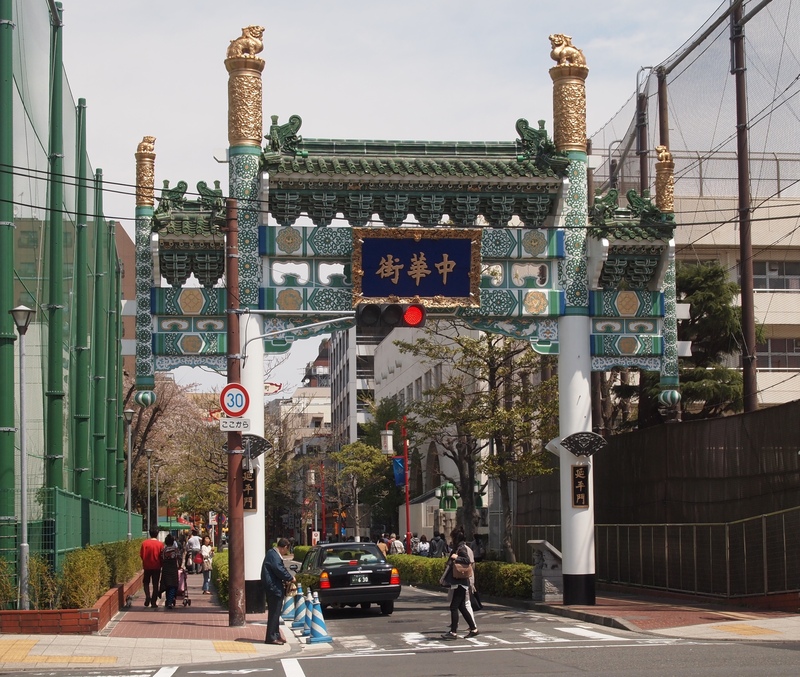 When war broke out between China and Japan in 1937, the growth of Chinatown came to a standstill, but it started thriving again in 1955, when a large goodwill gate was built and Chinatown was officially recognized by Japan. Almost immediately, I’m enticed into a three-story shop called Amina Collection. It has cute clothing, accessories and home decor mainly imported from India and Nepal. Why it’s in Chinatown, I don’t know; the shopkeeper, who has her hair wrapped in a large turban and wears a maize-colored flowing skirt, tells me her corporation owns many similar shops in Japan. What I really love are the incense aromas and the whimsical and enchanting music piped in through the shop. I ask the shopkeeper if they sell the CD with the music playlist, but unfortunately for me, she says the owner downloaded the playlist to an MP3. I also find some cute tops and kimono toppers (the kind of kimono cover-ups sold in America, not traditional Japanese kimono). Since I’m just starting my walk and don’t want to buy anything yet, I tell the shopkeeper I’ll return later. At this time, I think the walk will bring me full circle back to Ishikawacho Station, where I can easily return to shop before heading home. I continue into Chinatown, overwhelmed by crimson and yellow signs, fierce dragons twisting and turning on buildings and signs, shops with Chinese lanterns and masks, huge restaurant boards with pictures of enticing dishes, and touts in front of each restaurant beckoning tourists in. It is getting to be lunchtime, but my stomach takes a turn at the thought of eating Chinese food. When I was in China, I was sick almost constantly from the food, but I think maybe in Japan the Chinese food will be fine. After all, the Chinese restauranteurs must cook to Japanese tastes, just like they cook to American tastes in the USA. Though the large multi-ingredient dishes look mouth-watering, I figure maybe I can stick to something like steamed dumplings that aren’t cooked in oil. My hunger gets the best of me, and I drop into a tiny joint where I order three shrimp steamed dumplings with a Pepsi. It costs nearly $10 for that tiny meal, which is meant to sustain me all day. After I leave the restaurant, my stomach immediately cramps up and I wonder if it’s because of the food or just my fear of eating Chinese again. After lunch, I’m in search of the Kantei-Byo. The original temple, known as the Kuan-Ti Mao Temple, suffered many disasters. It was built in 1887, destroyed by the 1923 Great Kanto earthquake, and suffered damages during the 1945 Allies air attack. In 1981, it was struck by lighting and caught fire. It burned down again in 1987, and finally, was reconstructed in 1990 as Kantei-Byo despite the political differences of the Taiwan and Beijing Chinese. I finally find the temple, with a huge Coke Zero truck parked in front. The light doesn’t favor this view, so I go immediately into the temple courtyard. Two golden dragons greet me on the wall of the temple. I love the wonderful details under the eaves of Chinese temples. The visitors to the temple light incense sticks and bow and pray to the gods within. Here’s the view from the temple to the outside gate. Much better than the outside-to-inside shot with the Coke Zero truck. I find colorful and intricate architectural details and relief carvings under the temple’s eaves. Inside the temple is gorgeous, but they want 100 yen to go inside and I’m not allowed to take pictures. If I were allowed to take pictures, I’d gladly pay the entrance fee, but as I can see the altar from outside, that’s enough for me. Just outside the temple, I find another in the line of Amina shops and I go inside to try on more cute tops. The two salesgirls look so cute, I can’t help but try on tops in the shop that are similar. They look terrible on me, sadly. I guess when you’re super tiny, you can get away with wearing anything! Outside the shop, I encounter these two characters, one of them next to a wide-mouth panda entrance. Finally, I make my way out of Chinatown and head to the waterfront. First, I encounter the memorial commemorating the Reverend James Curtis Hepburn, a medical Protestant missionary who created the first Japanese-English dictionary in 1867 and Romanized the Japanese characters. He often treated Japanese and Chinese patients for free in his house if they couldn’t afford payment. The memorial marks his and his wife’s work from 1859-1892. The south end of Yamashita Park extends 2/3 mile from the Yamashita Pier to the Osanbashi Pier. To cover the flood control pumping station at the south end, a raised platform has an ornamental water cascade that extends from the upper level to street level. At street level, the ornamental water cascade ends in a pretty pool. From Yamashita Park, I can see Yokohama Harbor. Today is the perfect day for a walk, with temperatures in the high 60s and a brisk wind. How I love windy days when the temperature is right. Looking inland, I can see the buildings fronting the park. The Marine Tower was belatedly constructed in 1961 to celebrate the 100-year anniversary of Yokohama’s founding in 1859. There is an observation deck at the 100-meter level, but I don’t go up today. At 106 meters is a lighthouse lamp visible over the bay for 24 miles; it is the biggest inland lighthouse in the world. General MacArthur stayed at the Hotel New Grand on the evening of August 30, 1945 to begin his stint as the commander of the occupying American forces in Japan. Also from the hotel, he boarded the USS Missouri battleship on September 2, 1945 to accept the Japanese surrender, thus ending World War II. A fancy rose and flower garden in the park invites a stroll. Along the harborside walkway, I can see the north part of Yokohama. Off a small pier south of Osanbashi Pier, the Hikawa-maru, a luxury ocean liner built in Yokohama in 1930 is permanently moored. It made 238 crossings between Japan and the U.S. West Coast from 1930-1960. It is now retired from service. The Guardian of the Waters statue was a gift from sister city San Diego to Yokohama and its people. Looking south along the waterside walkway, I can see the 1989 Yokohama Bay Bridge. As I approach the north end of Yamashita Park, I have a better view of Yokohama with its iconic Ferris wheel. The Osanbashi Pier is at the north end of Yamashita Park. From here, I’ll be heading inland. Westgate provides teachers with a phone, but we’re only allowed to use it to make calls to a pre-programmed list of numbers. We are not allowed to use it to call anyone who is not programmed into the phone. We can accept calls, but we can’t make them. Besides, it is an old-fashioned flip-phone and not a smart phone with fancy features like GPS. I have my iPhone from the U.S., but so far I haven’t had the need to get a pre-paid SIM card for my phone. As long as I have access to wi-fi, at home and at work, I can use the phone for data or messaging. I was advised that I can Google directions to a destination by just entering in the beginning station (in my case Fuchinobe) and the end station, and I can get directions as to when to switch trains, how many stops between stations, etc. I can even get a timetable.